When faced with little money, dodgy bus timetables and a schedule to keep, what's a gap year student to do but hitchhike, right? Wrong! Though hitchhiking has long been romanticized in books and films as the adventure of a lifetime, what these warm and fuzzy presentations forget to mention is what happens when the adventure ends. While missing persons and murder are at the very far end of the danger spectrum, it remains a fact that hitchhiking puts travelers at the mercy of others. Rather than putting yourself in this position, spend your gap year travelling safely on public transportation. As with everything in life, there is an element of risk. It is inherent to our nature that we want to keep ourselves out of harm’s way. To put ourselves in positions in which we could become hurt would work against evolution. It would mean that the individuals, who were most successful, would in fact die first. Thus we would be de-evolving instead. Hitchhiking has a lot of stigma attached to it. For many people, hitchhiking is for vagrants, people without money, and occasionally, students on charity events. Around the world however, hitchhiking has began to grow in popularity once more. People are no longer limiting themselves to trains and buses in an attempt to cross land, but they are putting their trust in fellow human beings. There is one very important fact to remember when looking at the great big scary world as a whole; it is in fact, a collection of individual. People’s individual capability to do terrible things is much lower than one might expect. If you look throughout history, the worst atrocities have been committed by organizations or groups of people, not individuals. Of course there are exceptions to this rule, but they are the minority. The most dangerous part of hitchhiking is the capability of drivers. Car crashes cause a lot of deaths all over the world and this is the most likely thing that can go wrong. 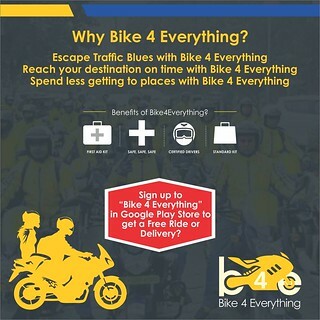 Bike4Everything provides you a way out from all such maneuvers and dangers and lets you travel the way you want to. 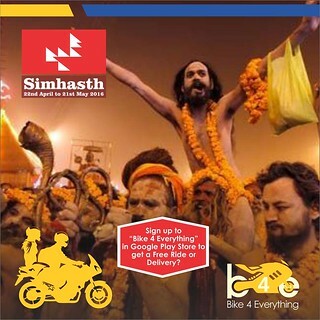 Whenever alone, reaching everywhere on time through the tough traffic congestions, in much lesser rates and without hacks, Bike4Everything is your option! Designed By : Hvantage Technologies Inc.